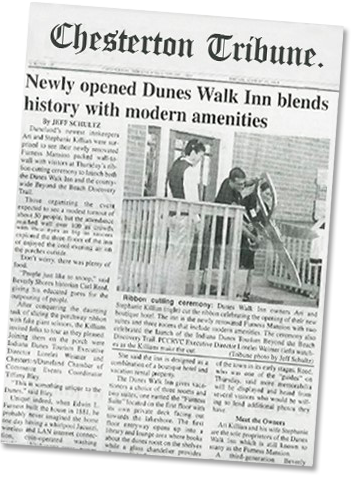 Join Indiana Dunes Tourism, DunesWalk Inn owners and Chesterton/Duneland Chamber of Commerce to celebrate the launch of the Beyond the Beach Discovery Trail and the opening of the new DunesWalk Inn. Visitors can stop by 1491 N. Furnleigh Lane, in Chesterton, between 5 and 7 p.m. Thursday to learn about treasures along the Beyond the Beach Discovery Trail and tour the historic Furness Mansion recently renovated and converted into the DunesWalk Inn. There will be refreshments and brief presentations on the Beyond the Beach Trail and history of the Inn. Pick up a trail guide showcasing more than 50 of the regions natural, historic and cultural treasures. Unlike a linear hiking or biking trail, the Beyond the Beach Discovery Trail allows users to set their own route and visit natural, historic and cultural sites throughout the region that best fit their interests and timetable. Curious about autumn bird migration throughout the Indiana Dunes, but not sure where to start? Indiana Dunes Tourism will also offer Ken Brock’s Birds of the Indiana Dunes published in partnership with the Shirley Heinze Land Trust at no charge while supplies last. The trail and bird guides will enable visitors and residents to appreciate the upcoming autumn bird migration that takes place throughout the Indiana Dunes as they explore sites along the Beyond the Beach Discovery Trail. Explore biking, paddling, fishing, hiking, historic and other sites along the Trail using the Trail Guide or by visiting the Beyond the Beach Discovery Trail website at BeyondtheBeachDiscoveryTrail.com. Subscribe to Beyond the Beach Trail news and updates at blogbeyondthebeach.com.